(1) in PSP was found to be bacteria.31 Saxitoxin (1) and neosaxitoxin (7) are also reported to be produced by the fresh water blue-green alga, Aphanizomenen flos-aquae.32334 Structurally the toxins of this class could be divided into two major groups, saxitoxin (1) and neosaxitoxin (7). The members of these two groups are further diversified by the presence of 11-O-sulphate or N-sulphate, the absence of carbamoyl group (13, 14, 15) and oxygen at C-13 (15, 17). Originally it was thought that the shellfish accumulate toxins by filter feeding the toxic plankton during blooms. The toxins then enter into the hepatopancreas where most toxicity is normally found. It was expected that the toxicity of the shellfish will be lost over several weeks or months after the disappearance of the plankton. But this did not happen. In fact, the first source of saxitoxin, the toxic Alaska butter clam, S. giganteus was found in water where no noticeable bloom of the toxic plankton was seen. Moreover, the toxicity which is mostly localized in the siphons, did not disappear even after a year in uncontaminated sea water. Paralytic shellfish poisons were found in nonfilter feeding snaits, crabs, and toxic macro algae where the secondary transfer of the toxins was not possible. Thus, the mechanism of toxification of these organisms is still not clearly understood. Schantz et al35 first isolated pure saxitoxin (1) from the Alaskan butter clam using weakly basic Amberlite IRC 50 and alumina chromatography. The Alaskan butter clam is still considered the best source of saxitoxin. The isolation procedure is fairly simple. However, this procedure is not applicable for the isolation of other shellfish toxins, since these are not strongly basic. A general procedure which is now commonly used had been developed.36,37 In the procedure,37 the mixture of the toxin is separated from the other constituents by selective absorption on Bio Gel P-2 or Sephadex G-15. The toxin fraction is eluted with a dilute acetic acid solution. The mixture of toxins is then applied on a column of weakly acidic carboxylic acid resin, Bio-Rex 70 in acid form, the acetic acid gradient elution furnishes pure toxins in the reverse order of the net positive charge of the molecule. The toxins with negative net charge are not separable by this technique. However, they can be separated by either preparative thin layer chromatography (TLC) or careful chromatography on Bio-Gel P-2. There are a number of assay methods for detecting saxitoxins.17 In the mouse assay, each mice weighing 20 g are injected (ip) with 1 ml test solution of adjusted pH and toxicity. Time of death is measured, and the toxicity in mouse units (Mu) is found from the standard table and corrected by factor obtained from control mice injected with the standard saxitoxin dihydrochloride solution and expressed in micrograms equivalent of saxitoxin dihydrochloride. One mouse unit (Mu) is the amount of toxin needed to kill a 20 g mouse in 15 min. The assay is very reliable. 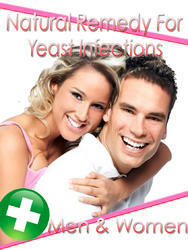 However, it does not give the amount of individual toxins and latent sulphated toxins. The serious drawback of the method is the requirement of mouse of uniform size, which is sometimes difficult to obtain. Chemical Assay: Bates et al38 have developed a fluorometric assay of saxitoxin based on the degradation product formed by treatment with NaOH-H2O2. It is quite sensitive method for saxitoxin derivatives, but not for neosaxitoxin derivatives. The limitation of the method is that the other fluorescence products present in the crude extracts interfere in the measurements. High-Pressure Liquid Chromatography (HPLC) Assay: The method developed by Sullivan et al39,40 is used for routine analysis. All toxins, including latent toxins, can be quantified in a fairly short time. The method is very useful for metabolic studies of toxins. Immuno assay: Davio et al41 has developed a radioimmuno assay that is very sensitive in the detection of saxitoxin. However, the utility of the method depends upon the selection of an antibody with desirable cross reactivity to toxins with diverse structure variations. Fly Bioassay: Ross et al42 have developed a method to substitute the mouse assay. In the method flies are temporarily immobilized at low temperature and injected with a minute quantity of test solution using a micro syringe. However, the method has not been officially recognized. nh many PSP samples. 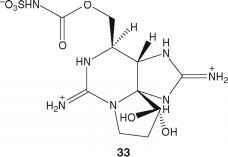 Its structure (29) was established on the basis of spectroscopic data and chemical correlation with gonyautoxin-II, neosaxitoxin and saxitoxin.55-58 Reduction of gonyautoxin-I (29) gives a mixture of neosaxitoxin (27) and gonyautoxin-II (30), which can be further reduced to saxitoxin (1). Similar reductive biotransformation was observed in scallop tissues.56 Gonyautoxin-I and its stereoisomer gonyautoxin-IV are probably the most unstable among the PSP toxins. Gonyautoxin-III (31) is the 11-epimer of gonyautoxin-II (30).60,61 It forms about 7:3 equilibrium mixture of (31) and (30) in a neutral or higher pH solution. It is believed that thermodynamically less stable gonyautoxin-III (31) is the parent form that exists in the living organism. Gonyautoxin-IV (32) is the 11-epimer of gonyautoxin-I (29). Gonyautoxin-V was first isolated from the Japanese and Alaskan PSP samples. Subsequently, it was found in a number of other organisms.55,62,63 It is the major toxin in the tropical dinoflagellate, P. bahamense var. compress.64 The structure was established by several groups under different names.65,66 Gonyautoxin-V (33) is the carbamoyl-N-sulphate of neosaxitoxin (27), and almost nontoxic. 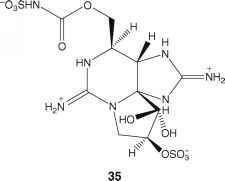 Hydrolysis of (33) with weak acid yielded neosaxitoxin (27) a potent toxin. Gonyautoxin-VIII is the first toxin that was found to have an N-sulfonyl group and a negative net charge on the molecule.70,71 The toxin was characterized as carbamoyl-N-sulfonylgonyautoxin-III (35). It was easily isomerizes to epigonyautoxin-VIII. Treatment of the toxin with dil. mineral acid easily afforded gonyautoxin-III (30). C3 And C4 toxins are called latent toxins.63 They are not retained on a cation exchange column because of their net negative charge. The C3 and C4 toxins were assigned the structure (36) and (37), respectively. The structure of C4 toxin was confirmed by X-ray crystallography. Treatment of the C3 and C4 toxins with dilute acids readily yielded gonyautoxin-I and IV, respectively. The presence of sulphate conjugation is characteristic of saxitoxin class of toxins. In the dinoflagellates, most toxins occur as 11-O-sulphate and/or N-sulphocarbamoyl derivatives, and saxitoxin (1) is a minor component. The occurrence of N-sulphated groups is rather rare among natural products. The N-sulphated groups are easily hydrolysed by weak acids and also possibly by the enzymes in the biological system. It is not yet clear whether the formation of the sulphated toxins precedes the unsulphated ones in the dinoflagellates. However, it has been proved that the reductive cleavage of O-sulphate could take place in shellfish to give unsulphated toxins such as saxitoxin. Similarly, the N1-hydroxy group of neosaxitoxin (7) series can be reductively removed. It is not yet known whether saxitoxin types of compounds are the precursors of neosaxitoxin types or vice-versa in the dinoflagellates. Synthesis of (±) saxitoxin has been achieved by two groups. Kishi's group72 at Harvard was the first to report the synthesis of (±) saxitoxin. The strategy of the synthesis (Scheme 1) was to construct A/B ring first, and then attach the ring C (38-45). The key step in the synthesis was the acid catalyzed ring closure of the bicylic intermediate (41). Using a mixture of acetic acid and trifluoroacetic acid, the compound (42) was obtained in 50% yield. Removal of the protecting groups gave (44) which on treatment with chlorosulfonyl isocyanate followed by hydrolysis finally furnished (±)-saxitoxin (45). 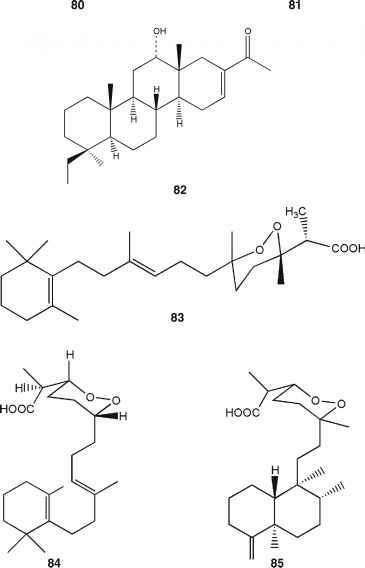 Jacobi's group73 reported a new synthesis of (±)-saxitoxin in 1984. The strategy in the synthesis (Scheme 2) (46-52) was to construct the C/D ring of saxitoxin first and then to add ring A. Thus the spirobicyclic intermediate (51) was cyclized to the tricyclic compound (52), which was then converted into (±)-saxitoxin (45) as in case of Kishi's synthesis. The biological assays for marine toxins are most widely utilized method for their detection. A wide range of organisms are sensitive to the toxins and therefore are potential test organisms for a bioassay, but the mouse and housefly are the only species utilized to date. The mouse bioassay has been adopted by the Association of Official Analytical Chemists as an Official Procedure','and is in use today as the primary analytical technique to support the majority of toxin-monitoring programmes in shellfish. The pharmacological activity of the saxitoxins at the molecular level has been exploited in developing assay techniques. The toxins bind to sodium channels in nerve cell membranes, preventing the influx of sodium and subsequent depolarization of the membrane. A number of electrophysiological systems have been utilized for measuring the binding events. These are frog sciatic nerve,79 voltage clamp of single nerve cell,80 and blockage of sodium conductance through single-sodium channel isolated in lipid bilayers.81 These techniques are useful for determining the pharmacological properties of the toxins. They are, however, unlikely to serve as routine assay techniques. Johnson et al82,83 were the first to develop immunological techniques for assaying saxitoxins. Saxitoxin was coupled to bovine serum albumin (BSA) via formaldehyde treatment and antibody prepared from rabbit antiserum. Carlson et al84 developed a radio-immunoassay (RIA) capable of detecting low level of saxitoxin. However, neosaxitoxin exhibited no cross reactivity. Chu et al85 have developed an enzyme linked immunosorbent assay [ELISA] to the PSP toxins that is sensitive to about 2-10 pg STX. Since the toxicity of a shellfish extract is due to the collective effect of a number of different toxins present, the application of immunoassays for accurate detection of Total Toxicity'is very difficult. However, immunoassay methods can be of much use as a rapid Field Test"for detecting the presence of the PSP toxins. Schantz et al86 have developed a colorimetric assay based on the reaction of the saxitoxins with picric acid. The method, however, is not sensitive and prone to interferences. Gershey et al81 have described a colorimetric test based on a reaction with 2,3-butanedione, but this was also subject to interferences. Bates and Rapoport38 have reported a chemical assay for STX based on fluorescence of the 8-amino-6-hydroxymethyl-2-iminopurine 3(2H)-propionic acid a hydrogen peroxide oxidation product of STX. The method is extremely sensitive and fairly specific for the PSP toxins. Tetrodotoxin (TTX) is the best known marine toxin because of its frequent involvement in fatal food poisoning, unique chemical structure, and specific action of blocking sodium channels of excitable membranes.88 The toxin derives its name from the pufferfish family (Tetraodontidae) and occurs widely in both the terrestrial and marine animal kingdom.89 The marked fluctuation of toxin concentration in TTX-containing animals from different regions, and seasons led to the belief an exogenous origin of the toxin in these animals. The primary source of the toxin was traced by Yasumoto et al90 from fish to a dietary alga and finally to an epiphytic, or symbiotic, bacterium. The bacterium was first thought to be a Pseudomonas sp. then a Alteromonas sp. and finally Shewanella alga.91 Subsequently, it was found that the toxin is produced by a broad spectrum of bacteria.92-94 However, the identification of the toxin in bacterial cultures had been made on the basis of rather poor evidence. 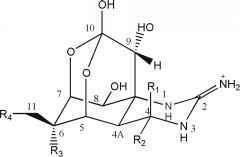 Tetrodotoxin is a colorless crystalline compound. It is virtually insoluble in all organic solvents but soluble in acidic media. It is weakly basic having the composition C11H11N3O8. The molecule is small (mol. wt. 319), but possesses the remarkable feature that the number of oxygen and nitrogen atoms are equal to the number of carbon atoms. The chemistry and biology of tetrodotoxin has been extensively studied95-101 and reviewed.102-112 Woodward95 demonstrated that the three nitrogen atoms of tetrodotoxin are present in the molecule as a guanidine moiety by isolating guanidine (as the picrate), following vigorous oxidation of the toxin with aqueous sodium permanganate at 75°C. Drastic degradations of the toxin by warm aqueous sodium hydroxide, pyridine-acetic anhydride followed by vacuum pyrolysis, phosphorus hydrogen iodide followed by potassium ferricyanide, and conc. sulfuric acid, gave closely related quinazoline derivatives of structure (53), where the nature of R depended on the exact mode of degradation. 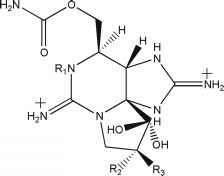 The formation of these key compounds indicated strongly that six of the 11 carbon atoms of tetrodotoxin are contained in a carbocyclic ring. It was surprising that in spite of the presence of the guanidine function in the molecule, the toxin was only weakly basic (pKa 8.5) and attempts to prepare crystalline salts did not succeed. However, treatment of the toxin with 0.2 N hydrogen chloride in methanol-acetone did furnish a crystalline O-methyl-O/,O/-isopropylidene-tetrodotoxin hydrochloride monohydrate which was given structure (54) on the basis of X-ray crystallographic analysis.95 If one element of acetone and methanol is subtracted from the molecular formula of the toxin derivative (C15H23N3O8) and adds two molecules of water one arrives at C11H17N3O8, the exact formula of tetrodotoxin. Comparison of the NMR spectra of compound (54) and tetrodotoxin further confirmed their close structural relationship. The two compounds, however, differ in one aspect. The compound (54) was a lactone having IR absorption band at 1751 cm1 while the toxin itself lacked a lactonic infrared band. On the other hand, the IR bands assigned to the guanidine moiety (1638, 1605 cm1 ) remained unchanged in the two compounds, thus demonstrating that the hydrochloride cannot be a guanidinium salt. The basicity of tetrodotoxin (pKa 8.5) was far too weak to be originating from the guanidine moiety. This fact, coupled with the observation that the pKa of the hydrochloride increased to 9.2 in aqueous dioxane, strongly suggested that the basicity of tetrodotoxin must be due to its Zwitterionic nature and that one of the hydroxyl groups is being titrated when the pKa is measured. Increased pKa is characteristic of hydroxyl ionization when one proceeds from a medium of high to one of low dielectric constant. 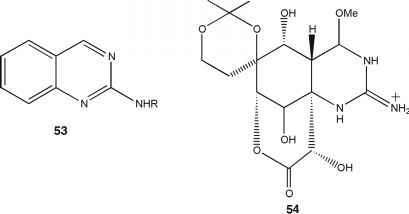 That which of the hydroxyl groups in tetrodotoxin is sufficiently acidic to furnish a proton to nitrogen, was revealed by the NMR spectral measurements of heptaacetyl-anhydrotetrodotoxin. If the methylated precursor of (54) was to undergo acetylation, the product would exhibit three characteristic changes, resonances in the NMR arising from protons on carbon which also bear acetoxy groups, viz. C-5, C-7 and C-8. In fact only one such resonance was present in the NMR spectrum of the heptaacetyl compound which forced the conclusion that two of the three groups cannot be present as free hydroxyls in tetrodotoxin, but must be combined in a new entity. If one of the hydroxyl groups combines with the lactones function to form a hemiacetal, only one characteristic proton should remain. Double resonance experiments proved that it is the C-5 hydroxyl in tetrodotoxin which is part of the hemilacetal (or a two-third orthoester) function. 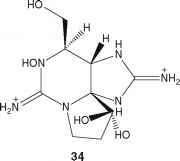 This consideration led to the assignment of structure (55) for tetrodotoxin. The presence of hemiacetal function in tetrodotoxin is unique (55a, 55b). This is the first example where a complex function of this nature is present in a natural product. furnished 11-oxotetradotoxin hydrate (60) TTX, 4-epi TTX, 6-epi TTX, 11-deoxy TTX, 11-nor TTX-6(R)-ol.115 Two epimers of 11-nor TTX are likely to be decarboxylation products of a hypothetical 11-CO2H derivative. 2.4.3 Mechanism of Tetrodotoxin and Saxitoxin Action Tetrodotoxin (55) and saxitoxin (1) are the most widely studied marine toxins by physiologists and pharmacologists. In spite of their structural dissimilarities, both are known to inactivate the sodium channel in the skeletal muscles and nerve tissues of various animals. The effect of these toxins is specific as both selectively block the transient Na+ current without any effect on the steady state current by K+ ions. Owing to this specific action of these toxins, many investigators are using them as tools in the characterization of ion channels. These toxins have become an extremely useful and popular chemical tool for the study of neurophysiology and neuropharmacology. Tetrodotoxin binds to the entrance part of the Na+ channel and inhibits Na+ channel and Na+ influx, and generates an active potential, thus, causing the blockade of nerve of muscle function. Narahashi126 has reviewed the mechanism of tetrodotoxin and saxitoxin action. Tetrodotoxin is commercially available and in carefully controlled doses is being used as muscle relaxant and pain killer in neurogenic leprosy and terminal cancer.